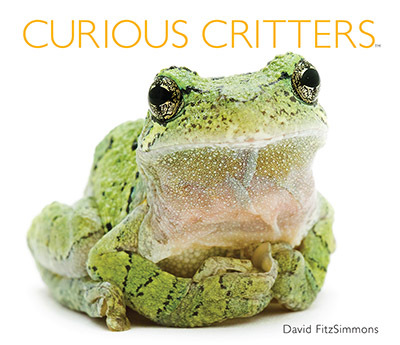 If the little creatures in your backyard or kid’s fishbowl had a high powered PR campaign, they couldn’t do better than David FitzSimmons’ Curious Critters. He’s a fantastic phtographer, dad and professor who’s given beetles, baby birds, frogs and flying squirrels a chance in the spotlight for kids K-4. Each subject is photographed on an austere white background, like a flower or piece of jewelry. Many are so much bigger on the page than in real life that you can appreciate all their spots, claws and creepy eyes. FitzSimmons speaks in the creature’s voice right next to them, letting kids see a little bit of their personality and life from their perspective. They prey animals are all gittery. The predators are a bit cocky. The blue jay brags about scaring you by sounding like a hawk. The baby red-eyed vireo has just fledged but can’t fly and says: “Mom’s a little upset, but she’s still feeding me. She said I flew pretty well.” That’s a perfect description of bird life for a little kid–a way to get them to leave such baby birds on the ground without misleading them about birds having an aversion to human smell. My daughter Ginger is just a few months old, but I felt compelled to read the book to her. I’m sure some day she’ll love it.